Find hotel near Conjunto Arquitetonico Da ..
It’s not often a complex is built for sheer architectural vanity, but that’s what master architect Oscar Niemeyer did in the 1940s. Postcard-picture perfect, the complex’s sinuous and curving architecture is fascinating and beautiful. Museu de Arte da Pampulha (Pampulha Museum of Modern Art): A stunning glass and concrete construct with landscaped gardens; it was once a thriving casino. 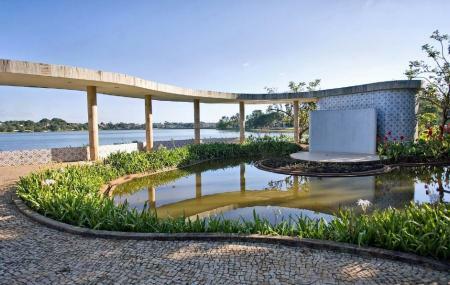 Casa da Baile (House of Dance): An exhibition and workshop centre for architecture and design, with a collection of Oscar Niemeyer’s own sketches. Igreja de Sao Francisco de Assis (St. Francis of Assisi Church): An elegant if unconventional looking church with 14 pretty mosaics describing the life and times of St. Francis of Assisi. Check the TripHobo listings of the independent attractions for their admission fees. How popular is Conjunto Arquitetonico Da Pampulha? People normally club together Igreja Sao Francisco De Assis and Parque Municipal Americo Renee Giannetti while planning their visit to Conjunto Arquitetonico Da Pampulha.